RV rentals and sales in Gresham. Specialises in the integration and migration of IT systems. Planning, designing, and drafting services for residential and commercial construction industries. Located in Gresham, Oregon. United Kingdom company providing interim management, business turnaround and development services. Providing aerial images of construction sites, landscapes, and real estate locations from their remote control 18 MiniBlimp. Based in Gresham. Offers full care boarding. Includes list of services, fees, and photos. Located in Gresham, Oregon, United States. Wholesale brokerage in the Southeast USA. Lines include intellectual property, nonprofit officers and directors, hazardous material haulers, and terrorism. PR firm with capabilities in financial, investor, and media relations, brand building, internal and crisis communications, and design and production. Includes company profile, services, clients and contact information. Based in London, England in the UK. Services include architecture, civil engineering, environmental engineering, interior design, land planning, landscape architecture, mechanical, plumbing and electrical engineering, structural engineering and program management. Full service floral and gift shop in Gresham and Troutdale area. Daily deliveries, order via toll-free telephone. Contains photos, trip logs, program information, and contacts. Includes sales list, photos and profiles of horses. Located in Gresham. 11 racquetball courts complete with tournaments and leagues in Gresham, Oregon. Store offers information on sales, service and accessories. Also provides coupons and links to manufacturers. Brewpub in historic Downtown Gresham. Contains menu, driving directions, brewing process, and background. 20 Be Bop Farm AMHA/AMHR breeders. AMHA/AMHR breeders. Standing at stud: B.Z.s Legacy. Offers photos, horses, carts, and pet products for sale. Located in Gresham. Breeds rabbits in a variety of colors. Located in Gresham, Oregon. Litter details, discussion of judging standards, and care tips are available. Based in Gresham Oregon, serving the Pacific NW. A club working to maintain and keep open, recreational areas. Membership details and pictures. Providing routine, medical, and surgical care for horses, dogs, and cats. Information about their staff and services, hours of operation, and newsletter. Providing routine, medical, and surgical care for horses, dogs, and cats. Information about their staff and services, hours of operation, and newsletter. Tyler. Full Service SSI affiliated dive store in Gresham. Complete training, trips, sales service and rentals. Full service ambulatory medical facility and hospital for horses. Frequently asked questions, virtual tour, and history of the hospital. Gresham. Dr. Shammai Rockove offers urologic health care for men, women and children in Gresham and the greater Portland metropolitan area. List of services and urology videos. Gresham and Portland. A birth doula is a trained labor support person who provides emotional and physical support to a laboring woman and her partner. Specializing storage technologies. Provides custom device drivers and other specific solutions for manufacturers of disk, tape, and fibre channel components on open systems platforms. 36 Be Bop Farm AMHA/AMHR breeders. est. 1859 in multnomah county, gresham, oregon. Meets on the 2nd Monday, 7:30 PM (Dark in July and August). Calendar, history and contact information. emphasizes immigration, deportation defense, and international law. located in gresham. est. 1889 multnomah county in gresham, oregon. A psychic dedicated to assisting others in spiritual growth and social transformation. Gresham. Christian resources, visitor information, and member information. Page of links to sites about Machen. offering services to individuals and small business owners with bankruptcy or domestic relations problems, from offices in eastside portland, clackamas, westside, and gresham. Official web site of author Lawana Blackwell. She is the bestselling author of the GRESHAM CHRONICLES and the TALES OF LONDON historical fiction series, both set in Victorian England. Featuring author bio, excerpts, sneak peeks, and an e-newsletter. (1956- ), atlanta, georgia. picture, biography, works, and books. Provides outline of courses available in the two-year Associate of Applied Science degree for graphic design. Located in Gresham, Oregon. SiteBook Gresham City Portrait of Gresham in Wisconsin. 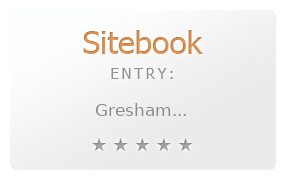 This Topic site Gresham got a rating of 3 SiteBook.org Points according to the views of this profile site.